This small game on the apple app-store, (retailing at £2.49 at time of press), recently gained the title of editor’s choice on their store-front, and they weren’t wrong. This game, however short, and however linear, is made of some optical genius and leaves you feeling like you’ve experienced a piece of art. Although nothing grand, it’s stunningly crafted, with a lovely arrange of illusions for you to progress through. A surreal puzzle game with a very cute and endearing aesthetic, which is delivered seamlessly. The game is presented in a crisp and cheerful manner. You wont find a garish colour scheme in sight. The backgrounds are very visually interesting and will hold your attention well. The ten levels of puzzling fun may not be difficult but they are more than gratifying when you complete their challenges. The art style is matched by it’s musical score and makes for an enjoyable play, although once you’ve completed the ten puzzles, there won’t be much that will bring you back for more. There’s not much dialogue here, and what we do have is written, but the lack of voices gives more weight to each word and you really take note of what’s said, no matter how cryptic it may sound. I’ve said before and I’ll say it again, if you get the choice between poor voice acting or nothing, less is definitely more. 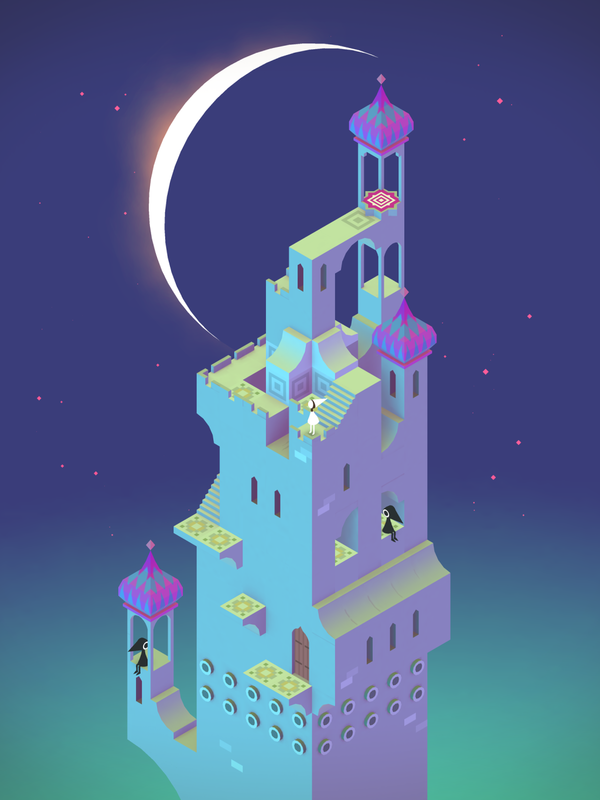 Monument Valley is easy to play, utlising the touch screen, you simply tap where to go or interact with the environment using it too. To complete each puzzle you guide the princess around, whilst converting and twisting the environment she stands on. The movable and interactive sections of the environment often stand out, normally being indicated by Lego-like nodules on their surface, or turnstile-like valves. It’s a simple concept that works really well with the touch screen on the iPhone and one that I could see doing well on the iPad as well. The only downside to such a lovely game is that there is no replay value, there are no reasons why you would come back for more other than to relive the experience. However, that being said, it’s still a worthwhile investment of your time and will eat up a commute to work, whilst putting a smile on your face. 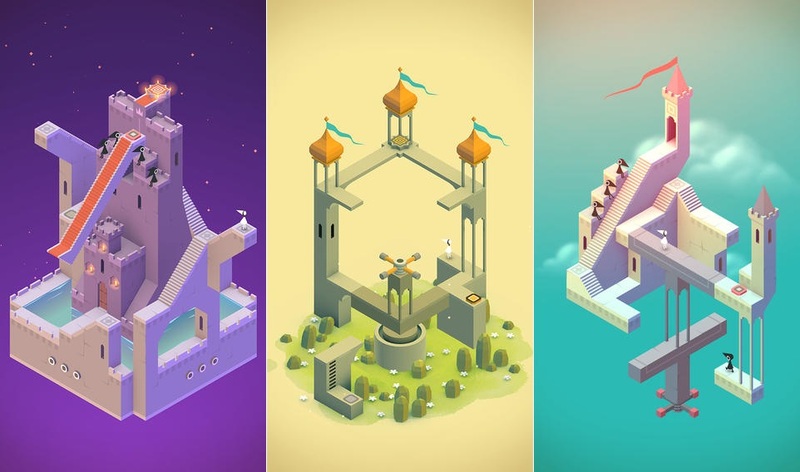 I found I got a lot of enjoyment from the strange world of Monument Valley and what I would unfold within each cleverly designed level. If you do decide to get this game, I hope you get as much joy out of the music-box-like puzzle as I did. 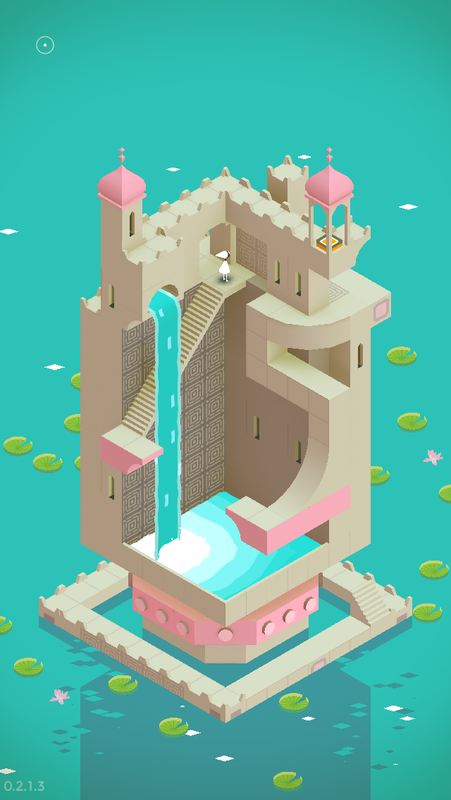 Monument Valley is a solid game despite its brevity and simplicity, showcasing that if you create strong enough components and ground them together well enough, you can create a brilliant game out of it. If you’re a fan of Journey, this will be right up your street. Certainly not for those seeking a thrill, or involving story-lines, but it’s a pleasant enough tickler with a bit of ingenuity thrown in for those seeking something a little different. Well-presented but not a hard-enough hitter to tip the scales any more in its favor. Thoughts? Questions? find another delicious indie strumpet for me to devour?